Precision machining, smooth thread, double-sided 4 teeth on the card head. Suitable for wider models and better quality. Suitable for most types of brake pistons, the top pressure operation is convenient and easy to understand. It is used to press back the brake piston and replace the brake pads. 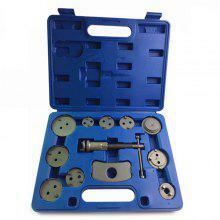 Disc brake sub-pump adjustment group brake pad adjustment replacement tool car repair special tools.